According to the U.S. Department of Education, more than one-third of undergraduate students transfer schools at least once during their academic experience. Recent data from the National Center for Education Statistics also show that transfer students, as a group, tend to earn degrees at a higher rate than their peers. Despite these facts, the process of transferring can prove to be quite problematic - except at Sonoma State University. 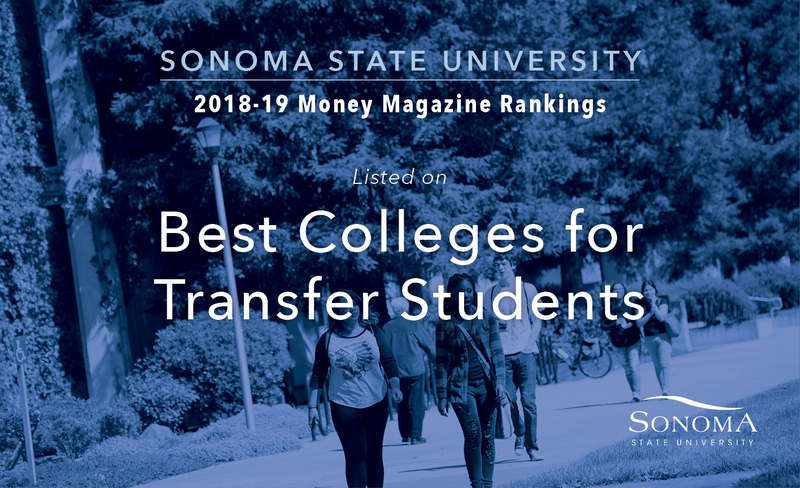 Money magazine has recently named Sonoma State University as one of the best colleges in the nation for transfer students. Out of a possible 727 colleges and universities, Sonoma State was ranked No. 12 for awarding degrees to students who transfer from community colleges and other universities. Using federal data, Money ranked its top 50 schools for transfer students based on the enrollment and completion rates of these students. Other factors included early career earnings and average student debt at the time of graduation. For California colleges specifically, another point of emphasis was the state’s “clearly defined pathway for community college students” and the mandate that general education courses transfer between institutions. More than half of the list is made up of colleges and universities located in California, with 15 being CSU campuses. Sonoma State also was ranked by the U.S. News and World Report in September as one of the Top Public Schools in the nation. SSU was also named in August as one of the nation’s Top Schools by Forbes Magazine. For more information on SSU transfer application requirements and application deadlines, visit Admissions and Records. Sonoma State University's Sociology Department has been ranked No. 1 in the United States among similar programs, according to schools.com. Sonoma State University has made Money magazine’s fourth annual Best Colleges for Your Money list, which ranks schools based on educational quality, affordability and graduate earnings.